It wasn't exactly a holly jolly Christmas at the Rousmaniere household this year. There were no chestnuts roasting over an open fire. It was not a silent night. It was less Deck the Halls, more pace the halls with a screaming baby, an overstimulated toddler, and two very tired parents. And, of course it just wouldn't be a holiday without some sort of family drama. Bah, Humbug. We decided to eschew any travel this year and nest at home, just the four of us. It was a good decision, but it still made me a little sad. Julia and Charlie were showered with gifts from friends and family near and far, and each gift we opened made me a little more sad, since they made me miss everyone that much more. We did get to visit with a good chunk of the extended Rousmaniere clan in town, which was a welcome escape for a few hours. Charlie didn't have much to say about the holidays this year, but it was pretty much the first year that Julia's actually been cognizant of Christmas. I'll never forget the look on her face when she walked into the kitchen on Christmas morning, spotted the toy kitchen that Will had been up half the night assembling and yelled: "What's THIS?! My very own kitchen? What a lucky girl I am!" And, I can still hear her little voice piping up in the hallway first thing on Christmas morning like so many little silver bells: "Dada, did Santa come?" Then, there was the magic of driving through the clear Christmas Eve night as Julia oohed and aahed over all the Christmas lights along the way. Maybe I've got a case of the baby blues, but something about this holiday always leaves me feeling a little empty. I'm not a religious person, so Christmas lacks that sort of meaning for me. And no matter how hard you try to avoid it, there's the extreme commercialism, coupled with the worry about people spending money they shouldn't be spending, and the worry about whether I've gotten the right gifts for everyone on our list. There's the pressure of feeling like I should be baking cookies and stringing garlands instead of running around doing last-minute shopping and cursing the stack of Christmas cards still sitting on our dining room table. There's the incredible burden of all this privilege: our warm home, the food on our table, the gifts we don't need sitting under our tree, when there are so many people out there who have nothing at Christmas, or any time of the year. 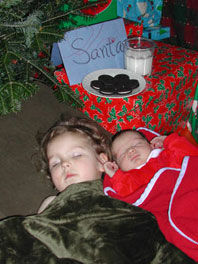 We sort of muddled through Christmas this year, through a fog of exhaustion on so many levels. Next year, I hope to find a way to make Christmas more about the real gifts in my life: my sweet William, my beautiful Julia, my precious Charlie, my family and my friends. Right now, the rest just feels a little tiresome. Join FitPregnancy.com's Managing Editor Dana Rousmaniere each week as she chronicles life with a new baby. Read the next entry: 1.1.07: Whose Bed Have Your Booties Been Under?